STT’s sub-editor had a pretty tough time coming up with a headline that had some hope of capturing the cavalcade of chaos detailed in the stories below. We’ll start with yet another turbine collapse in the Emerald Isle. High winds and wintry weather lashed much of Northern Ireland yesterday. In the day’s most dramatic incident, a giant wind turbine collapsed on a remote Co Down hillside. The massive structure, near the Begny Hill Road between Dromara and Ballynahinch, was photographed lying in pieces on the ground. The images also showed a large crane active on the site amid the wreckage. The Heath and Safety Executive is investigating the incident. 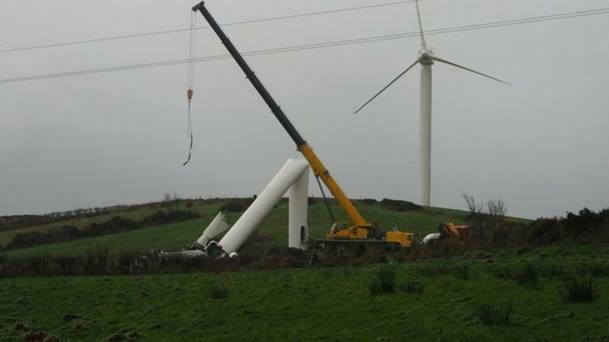 It is not the first time a giant wind turbine has collapsed in Northern Ireland. “In 2015, a wind turbine worth £500,000 crashed to the ground at Screggagh, Co Tyrone. The Moyallen Road in Gilford was blocked in both directions yesterday because of a fallen tree. On the Rostrevor Road in Warrenpoint, meanwhile, motorists had to battle through a curtain of sea spray as waves crashed over the town’s sea wall defences. In Co Antrim, the Aghalee Road in Lower Ballinderry was closed in both directions because of a fallen electricity pole. Diversions were put in place. At the Sprucefield roundabout on the A1, an overturned lorry caused travel chaos for city commuters. Traffic was slow moving on the Portaferry Road in Newtownards due to flooding – though the road was passable with care, police said. At Whitehead, meanwhile, the promenade was awash with seawater as high tides and strong waves surged into the street, leaving the promenade coated with thick brown seaweed. More gales were forecast to hit the province last night. The Met Office forecast for Northern Ireland said it was set to be windy with gales around eastern coasts, with today’s weather beginning with some sunshine during the morning, then clouding over with rain spreading across Down and Antrim later in the afternoon and evening. The rain will be heavy at times and could turn to snow over higher ground, with a maximum temperature reaching eight Celsius. Looking ahead, the weekend will begin windy and unsettled tomorrow, followed by showery outbreaks of rain, becoming heavy at times, the Met Office added. The wind was blowing hard over the last few days in the southern Italian peninsula, so strong that a wind turbine disintegrated under the force of the breeze. Aquilonia is a city of the sur of Italy, some 150 kilometers from Naples. 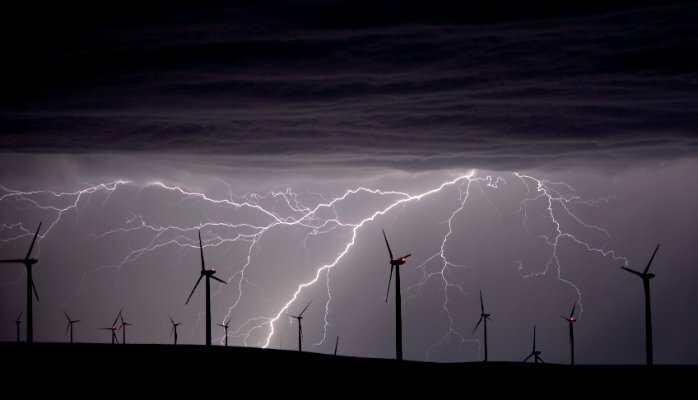 In this region, a wind farm allows the wind to be transformed into the strong wind that blows into it. One of the windmills in the park, which was filmed by passers-by, turns faster and faster, before disintegrating by throwing pieces of pallets and mechanism around. The video was broadcast in Italy all over the social networks and by the Republic. – and definitely not for the last time, an angry neighbour – no doubt being driven mad by incessant turbine generated low-frequency noise and infrasound – determined to take his tormentors out of action for a while with a few well aimed shots at the wind farm’s transformer. 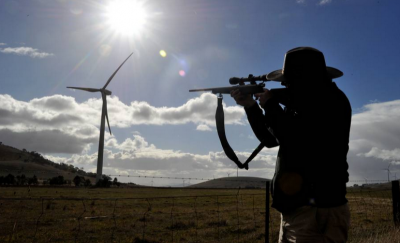 Alberta RCMP are investigating shots fired — at a wind farm. 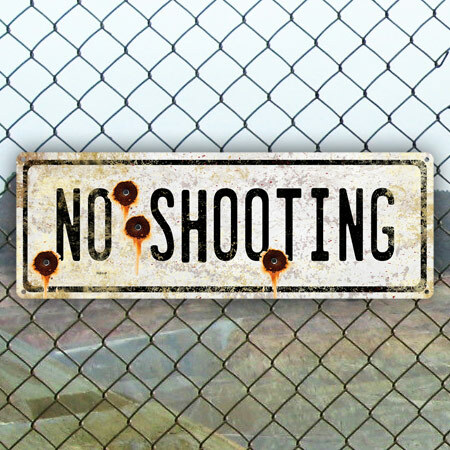 The shooting took place at a TransAlta site just south of Fort Macleod around 6 p.m. on Feb. 8. Employees found several bullet holes in one of the transformers on the wind farm. “It appears the shots were fired from a distance, possibly the nearby roadway,” according to an RCMP news release. When was the last time that a coal-fired power station exploded and sprayed debris, parts of the cooling tower, toxic chemicals and smoke around the local environment? Hmmm….thinking…. STT can’t think of an example in Australia, although there was the coal mine fire that was deliberately lit by Eco-fascists next to a power plant in Victoria a few years back, out to wreck the power system via a propaganda campaign against ‘dirty’ coal. The Greens carried on about it as if it were Armageddon. But exploding power plants? No, can’t think of any.